I wish I had a dime for every time my Dad said to sit up straight at the table, or my Mom told me to keep my shoulders back. They wanted me to have good table manners and look confident, but perhaps they also knew what science has now taught us: good posture has many health benefits and poor posture can severely limit your mobility, particularly as you age..
Good posture keeps your bones and joints in good alignment and reduces wear and tear on joint surfaces. It also decreases the stress on ligaments. According to Livestrong.com, good posture improves the efficiency of oxygen flow to your nervous system, organs and other tissues. It can help prevent future health issues like spinal disk problems and constricted blood vessels and nerves. Muscle & Fitness magazine also points out that good posture improves digestion and reduces acid reflux because it enables organs to sit in their natural position without compression. Most people think little about their posture until they begin having chronic back or neck pain. A posture analysis can help identify your risk for problems like kyphosis (commonly known as roundback) that affect mobility. According to the University Spine Center, sufferers of Kyphosis often slouch and struggle with breathing problems, back pain and tenderness, and stiffness. The effects of which however, can be reduced with physical therapy and exercise. You may be unwittingly standing, walking, or sitting in ways that will have a significant impact on your mobility. Let’s begin with your hips. The Fit3D Posture Analysis will identify if you have, for example, an anterior pelvic tilt. This is most common in people whose femurs are rotated, walk knock-kneed, and/or have flat feet. Anterior pelvic tilt causes hip, knee, and lower back pain. It will also cause a greater curvature of the spine (kyphosis), which will put you at risk for shoulder and neck pain, and headaches. Finally, and perhaps most common, poor posture causes shoulder problems. The shoulder is made up of three bones, the clavicle (collarbone), scapula (shoulder blade), and the humerus (arm bone) that are held together by the rotator cuff. As any of you who have had shoulder injuries know, the shoulder is a complex and delicate joint. Poor posture frequently causes shoulder impingement, which not only causes pain, it can make it difficult for you to raise your arms above your head. If unidentified and untreated, it will wear down the tendons in the shoulder (called bursa). A Fit3D Posture Analysis can get you ahead of all these risks. Why Fit3D for Your Posture Analysis? As part of the 3D body surface scan, the Fit3D ProScanner includes an assessment of your full body posture, from eyes and ears to feet. Unlike other tools that evaluate posture, the Fit3D ProScanner analyzes the position of your ears and eyes as a baseline, which provides important insight into your head and neck positioning. 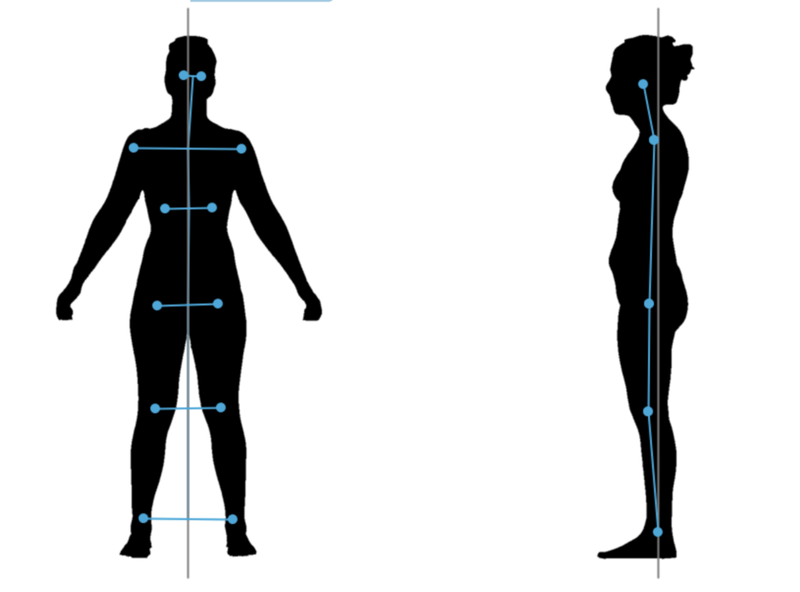 Our Posture Analysis evaluates your shoulders, hips, knees and ankle positions when you are standing. It also provides posture Wellness Metrics on body shape, waist circumference, waist to hip and trunk to leg volume ratios, and more. This is particularly important for people with mobility issues, chronic neck, back, and other joint pain. A Posture Analysis can help you focus your time in the gym and during physical therapy on the right activities to strengthen your core. Over time, as your fitness and health improve, you can take repeat scans to see changes and further calibrate your posture. And the Fit3D ProScanner Posture Analysis is the only one of it’s kind that visualizes your changes with an avatar. Lastly, and perhaps most importantly for your staff, the Fit3D ProScanner automates the entire process of analysis. Using the app with an intuitive interface, our system provides a report with an in-depth level of analysis that would typically require a clinician to determine.